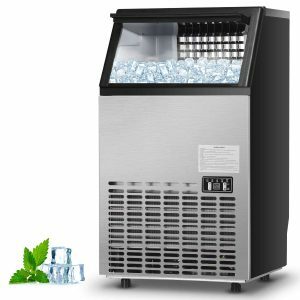 Costzon FWAM-01960 is a late 2018 release commercial style stainless steel ice machine that can make 110 pounds of ice every 24 hours, with a 33 lb. storage capacity. It is a built-in ice maker with a stand-alone design and can be used in cafes, bars, restaurants and parties. The average rating is 4.9 out of 5 stars by 10 customers as of today, which indicates a very high level of customer satisfaction. It works very efficiently and as a commercial machine it offers you the convenience of very quick ice making. You’ll get a total of 48 clear ice cubes that measure 0.9 x 0.9 x 0.9′ inches each in a cycle that is completed within 12 to 18 minutes. You can use it in your different cold drinks and meals. The efficient energy saver compressor has 200 watts of power and runs the way you’d expect it to be- is quite powerful. It has a thicker panel, a food grade liner and a thicker foaming layer for a more efficient heat insulation. You have the Add Water, Timer, Ice, Ice Full and Clean indicators with red and green lights and the + and -, On/Off and Timer Clean buttons on the control panel. You’ll get a 120” water line with the quick connect filter, an 80” water draining pipe and a shovel for ice transfer included in the box. Stainless steel Costzon Commercial Ice Maker weighs 64 pounds and measures 19 x 16 x 31 inches. You can choose to put the ice maker under the kitchen or bar counter as long as there is enough clearance on the sides and at the rear. Or you can use it as a free-standing unit, since it looks nice and modern in all stainless steel, as long as there is access to a water supply and drain. It is light enough to be put on a shelf or counter if you need the height for getting into a drain. It comes with the adjustable feet underneath for balancing it on uneven floors and to protect it from the potential humidity or water on the floor. The mesh part on the front panel ensures much easier and quicker heat dissipation. With a water usage ratio of 99% there will be almost no water wasted. It keeps the ice frozen for a while as it melts very slowly, but you may want to put the ice cubes in your freezer by using the ice shovel provided if you will not be using them straight away. A lot of you may find it easier to use an automatic unit like this one with a water hose and line, rather than filling the ice reservoir with water. One of the customers commented on the hardship of opening and closing the door as it requires a bit more effort than normal. But we think they may have received a faulty unit and the defect is not common to all. It is not very noisy but not very quiet either when it is doing the cycles. Other than that you’re getting quite good value for your money. 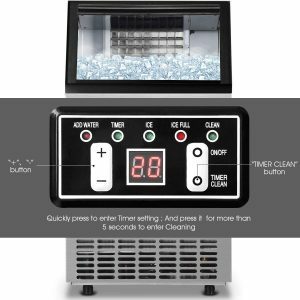 You can have ice all day long with this ice maker that runs very efficiently and at a high ice making capacity. You’ll get one year extended warranty with satisfaction guarantee and the customer service team at Costzon will be happy to assist you with any problems or queries you may have.